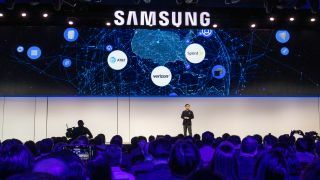 The Samsung Galaxy S10 wasn't announced at CES 2019 this week, but a lot of what is likely to power the new smartphone is in Las Vegas, from 5G technology to 7nm chipsets. The Galaxy S10 is the biggest imminent product not at CES today. Samsung did tease some smartphone hints at its CES press conference. "In the first half of this year we’ll be releasing 5G smartphones to the market," said Samsung CEO and President HS Kim on Wednesday. He proclaims "5G is here and now," while dropping names of 5G-ready US carriers that Samsung is working: AT&T, Verizon and Sprint. Samsung noted that it's the first company to receive FCC approval for its commercial 5G rollout - and any regularity approval at all. It's determined to launch the first 5G smartphone. Of course, the South Korean firm's rivals are trying to launch their own 5G phones in 2019, including OnePlus and Motorola. Even if Motorola gets there first with a 5G Moto Mod add-on that can be attached to the Moto Z3, it's not likely to compare to the first phone you can buy with 5G out of the box. Neither option – add-on or 5G built-in – will be cheap, according to the manufacturer we've talked to at CES 2019. Also at CES 2019 is the Qualcomm Snapdragon 855, the chipset that's expected to power the Galaxy S10 in some countries including the US (other regions, including the UK, may use Samsung's own Exynos 9820 chipset). The Snapdragon 855 is just 7nm in size, but it's more significantly powerful than the Note 9 from six months ago. You'll see key improvements over the Snapdragon 845 chip when it comes to the camera and the faster, 5G-capable X50 modem. We haven't seen Samsung's new phone in person, but Galaxy S10 leaks this month point to a new all-screen 6.1-inch AMOLED display with a 'hole punch camera' embedded into the screen. This seems to be Samsung's alternate solution for a notch cutout. It's putting the front-facing camera in the top right of the display to further reduce needless screen bezel. We got a glimpse of a Samsung prototype with a front-facing camera in the top right corner while we were at Qualcomm's Snapdragon Summit last month. Pretty soon that black void may be filled with pixels and an all-screen display. In-screen fingerprint sensor and three cameras? We've been waiting two years for a Samsung Galaxy smartphone with an in-screen fingerprint sensor, as it's been a rumored feature since the Galaxy S8 and S8 Plus. We're thinking it'll finally come to fruition as Qualcomm's ultrasonic fingerprint tech is ready. That would leave some extra space on the back of the phone where Samsung shifted its physical fingerprint scanner over the last two years. No worries of the empty space, as the company is expected to follow the trend of using three cameras on the back. It's not letting the Huawei P20 Pro hog the tri-camera spotlight. Of course, this is all rumored and up in the air at this point. There may actually be three different Samsung Galaxy S10 phones, not the normal two we see from yearly S-phone refreshes. In addition to a normal 6.1-inch version, we're seeing leaks suggesting a 6.4-inch Samsung Galaxy S10 Plus and a cheaper 5.8-inch Samsung Galaxy S10 Lite. This may be Samsung's iPhone XR rival. Each Samsung 2019 phone may have different battery sizes: 3,100mAh for the Lite, 3,500mAh for the Samsung Galaxy S10, and 4,000mAh for the Galaxy S10 Plus. That means the S10 Plus would be able to match the hefty Galaxy Note 9 battery capacity. We're a little more than a month from when we expect the Samsung Galaxy S10 to launch. CES 2018 continues through the end of this week, so we'll be scouting for more Galaxy S10 leaks in Las Vegas and globally until at least MWC 2019 in February.